Locals tend to gush so profusely about wintertime in Napa Valley that it’s as if they’d blended a perfect elixir capable of chasing the season’s blues away. If only they would bottle it. Well, they have, and it’s called Cabernet Sauvignon. To hear locals tell it, winter arrives solely to bestow optimal conditions to uncork the Cabs. Because if ever a wine could choose a best place or time to be consumed, Cabernet Sauvignon seems to have chosen winter in this Northern California valley as its fantasy microclimate. You couldn’t keep the cult of Napa Cabbers away, or so you’d think. Then came the October wildfires that lit up the foothills, both in the east and in the west, taking 22 Napa Valley lives, torching 652 Napa Valley homes and roughly five wineries, and damaging 50 or so other area wineries. When the smoke cleared, locals counted another casualty: tourists. But the question is, why haven’t visitors come back? One reason is a misconception about what Napa now looks like. The images (still) being broadcast are painting Napa along with Sonoma as damaged destinations. 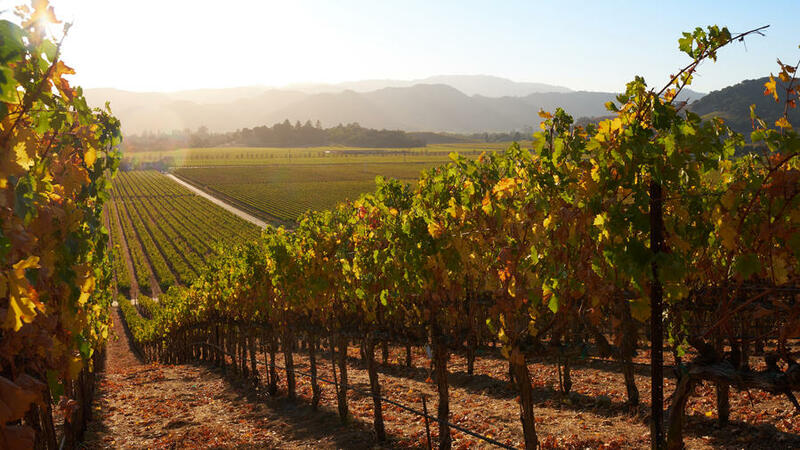 The truth is, these wine regions aren’t defunct. The coast is clear. And winter is coming. If you’re not familiar with Napa, we’ll translate. Gott’s is Gott’s Roadside, also in St. Helena. The counter-service “pit-stop” is anything but a pit, nor is it a pit-stop, which implies a quickness—although by all definitions, it is, indeed, “fast food.” Long queues of customers would get nerve-wrackingly hangry for the local institution’s burgers and shakes and other comforting items that are hand-spun, grass-fed, and definitely gently plucked from nearby dairies, farms, and ranches. The lack of long lines these days is telling. As to Kevin’s “cruise” down highway 29, an artery that connects Napa Valley towns—that is an indulgence so rare that it could easily induce a ripple of panic throughout the community that’s more accustomed to a herky-jerky crawl down the route. Rutherford Grill also took Kevin for a tailspin. What used to be a plan-on-getting-inebriated-while-you-wait restaurant was no place to get your buzz on in mid-October. You were seated immediately, Kevin says. Few diners rested upon the eatery’s red leatherette bar stools. That loss is receding into the past. Right now, many of the roughly 475 wineries are open for tastings, even in some of the hardest-hit AVAs of Atlas Peak and Mt. Veeder. “It takes a trained eye to spot any burn, though,” says Remi Cohen, Vice President and General Manager of Cliff Lede Vineyards (pronounced lay-dee). The winery’s tasting room is in Yountville, south of St. Helena; it also owns other properties, including Poetry Inn in the Stag’s Leap District. Wildfires surrounded the inn and the adjacent vineyards belonging to Cliff Lede. Luckily, both survived and the inn reopened within two weeks. That makes sense since one of the more striking images was of flames engulfing Signorello Estate, on the famed Silverado Trail, in Napa. The tasting room burned to the ground. Just three miles south of those ashes, a month after the fires, Remi and her friends enjoyed a half-day at Silverado Resort & Spa. Because vineyards themselves acted as firebreaks, many properties were spared. Remi believes the vineyards played a role in saving Poetry Inn. And although Signorello’s tasting room didn’t survive, all of its old vines did. As for the Cabernet grapes, one of the last varieties to be harvested, Remi, who is on the board of Napa Valley Grapegrowers, says that about 90 percent had been harvested before the fires. Now, the big chicken-or-the-egg question for Napa is whether the Cabernet is made for winter, or if winter is made for Cabernet. “Winter has a totally different rhythm than the other seasons,” Kevin says. It attracts aficionados—a lot of wine buyers and bottle collectors. That means eavesdropping will net you knowledge. Please come. Kevin would really like to stop cruising down 29. Can’t you tell?